And of course, click on the pictures to embiggen. Gosh, is that even a word?? For four mats, cut six strips from the width of your fabric, the strips I've used are 2" wide. 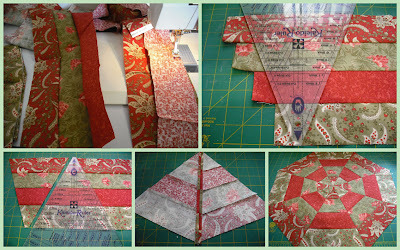 Sew all strips together using a diagonal seam to make one long binding strip, and press in half, wrong sides together. Pic 1: I always leave a long tail on my binding, and because the mats have 8 short sides, I pin the first corner in place and start sewing on the second 'straight side'. Pic 2: Mark the location of the corner seam with a pin. Stitch right up to the pin, and take a couple of back stitches. Pic 4: Fold the binding strip back down again, pin in place and continue sewing. Pic 5: Continue this process until you've rounded the second last corner, and stop. Break off the threads, and pin the last corner in place. This is to ensure you have long binding tails to make the final join easier - it's tricky tugging all that mess under the presser foot! Pic 6: Because I've used a 2" wide binding, I overlap the ends by 2" and cut away the excess binding. If you used 2.5" wide binding, then overlap by 2.5" etc. Pic 7: Remove all pins, and execute your final diagonal join. I like to pin far enough apart so that my sewing machine foot fits thru the middle without removing the pins. Pic 8: Now you'll have the exact amount of binding to finish up binding your placemat, and the final join is neat and tidy. You're done. Just an aside: For small projects like this, I love to be all virtuous and use up lots of small pieces of batting. To save myself the trauma of sewing all the bits together, I use my little friend 'basting spray'. Cut your backing fabric an inch larger than the mats, spray the wrong side of the fabric with basting spray, and arrange the little pieces of batting so that no pieces overlap. Then spray the batting, and place your mat carefully on top. Works every time! "We'll be in to help you with the chores later Mum ... we're sleeping here ..."
In other news: I've finished quilting on the spiderweb mats, and I hope to get to the binding this afternoon. I promise to share how I do it :-) Gail asked if I quilt on my longarm? I wish! But no, I quilt all my projects on my Bernina. 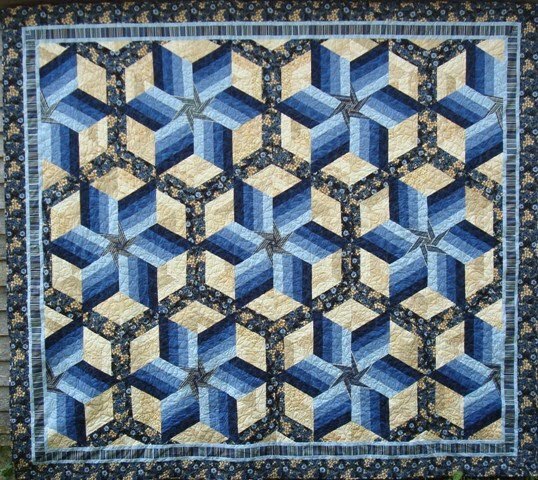 I've only ever sent one project out for machine quilting, and though a longarm machine is on my wishlist, I don't have one on my horizon right now. Trust me, anyone can quilt these mats ... really!! And while I was waiting for Amy to get home last night, I thought I'd draw up a little something I'd like to make for the dining table. A nice big fat runner. This block is called 'Lady of the Lake'. Sounds a little 'Anne of Green Gables' to me :-) The blocks will be 12", and I'll need to make 14 of them. Seems like I'm always drawing things up in shades of green lately - I know it goes so well in my home ... but blue is my favourite colour! 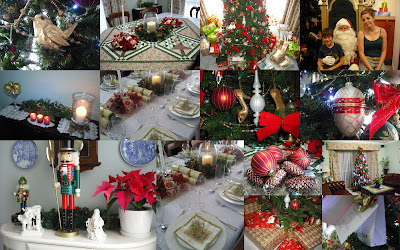 Here it is the day after Christmas here in Oz, and instead of finding new homes for our gifts, I'm blogging. Look at me with my fancy collage pictures. I'm like a kid with a new toy! Pic 1: You'll need four coordinating fabrics - from which you'll cut 2.5" strips (you can use any size you like, but that's what I used). If you're making two placemats, cut two strips from each fabric. 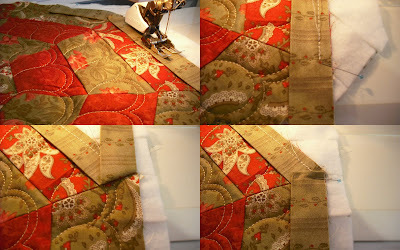 If you're making four placemats, cut four strips - you get the idea :-) Make up however many strip sets you need using each of the four fabrics. Makes more sense when you see the second picture. Pic 2: Using your Kaleidorule (from Marti Michell) cut your first wedge, and then trim off the jaggedy bit on the other side. Pic 5: And finally you'll have a completed spiderweb placemat top. Note: While I use my Kaleidorule template, there may be other products that do the same job, so check your supplies and see what you have. Also, this is not my exclusive pattern (far from it) - it has been shown on other blogs, in books and magazines. No claims to fame here. Heidi: How fun that you met Donna at Quilting Corner. You guessed right about her NI friend! I'm hoping to be over in March/April and vacationing with the lovely Donna. The world really is a tiny place! Merry Christmas to all my buddies out in cyber land. We've survived the flurry of present opening, the food-fest of lunch, and the lazy dinner that followed, and we've thoroughly enjoyed ourselves. Today my side of the family visited, we had twelve for lunch, and I think that's the max we can cater for on one table. Any larger, and we'll be calling for backup surfaces. It was wonderful to share meals with my parents, my brothers and SIL, my grandparents, along with my own little family and Amy's boyfriend. Marty's family (being European) traditionally celebrate on Xmas Eve, so we were out last night at the St Kilda Yacht Club with his extended family which was wonderful. And to add to the celebrating, the surprise wedding of one of Marty's cousins. So much fun. I hope everyone is having wonderful times with friends and family, and now I'm off to rest a little, and then see if I can put my house back to rights. It looks like a wrapping paper tornado swept thru here! Christmas is how many days away?!? I have been a neglectful blogger of late - but I hope in the immediate future I can remedy that. As of 5pm yesterday, I'm officially on holidays until the 18th of January. After Christmas, I'll have expanses of free time (hahaha) and tons to share I'm sure! There is still stitching happening in my sewing room sporadically, and as I'm still working on a couple of Christmas gifts, I can't share just now - but if I remember to take a picture before I frantically wrap them up, I'll share the end results. One thing that has entertained me (often late at night) is that I have discovered some wonderful home decorating/house blogs. And I really love them! So much fun to peek into other peoples homes, and great inspiration for decorating my own. 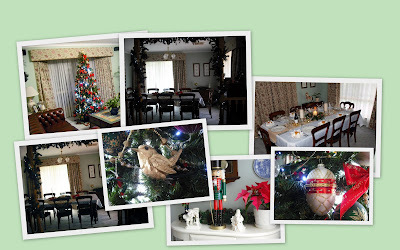 Since I don't have any quilty loveliness to share, I thought I'd show a couple of Christmassy things. Though it's nothing like the fabulous vignettes you'll find around blogland, this is what you see on my china cabinet in the front entryway. 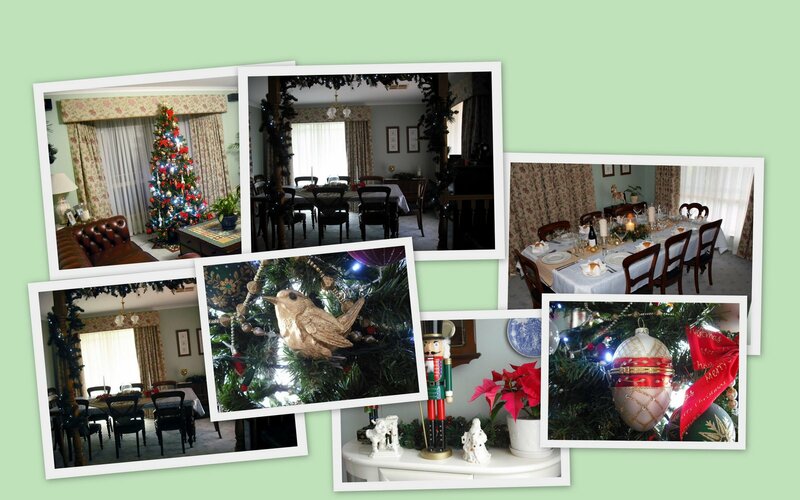 You'll find Nutcrackers all over the house - I went mad for them last year. The Mikasa Santas have been with us for a long time, and some day in the future I will find the creamware Nativity scene. You just can't rush these things. Each year I add new decorations to the tree, and though I purchased many more, here are some of my favourites. Three birds came home with me from the Christmas shop on Goodwood Road. I should have purchased more - they're adorable. And three of these adorable Faberge style eggs. They open up to reveal a little treat inside ... though mine are 'treat free' today - who knows what Christmas day will bring? Isn't this always such a busy time of year? Before I can seriously think of Christmas, there is first my birthday and then Amy's birthday to deal with. And deal with in a lovely way of course. Miss Amy turned sweet sixteen yesterday - she is such a treasure. How ever did those years fly by so quickly? Before I know it, it will be Cameron's turn! I have still managed to get in a little sewing for gifts - but I really must get busy, as there isn't much time to go now. Cameron's family day care lady is like part of our family, so I wanted to make her a little treat too. This is the candle mat I made up for her. 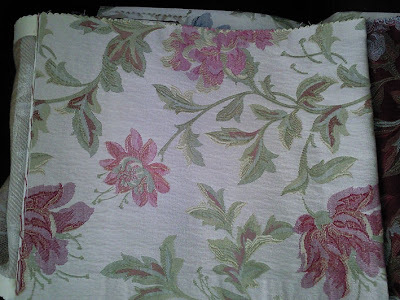 I've had this Thimbleberries fabric for such a long time as it is a feature in one of my patterns. I estimate I've had 150 yards of it pass through my hands over the years. On Saturday evening, Marty and I hosted a formal dinner party for six of our best friends. I had such a great time organising the menu, gathering supplies, and my favourite of all, making and folding the napkins. I found a fun method of folding on Martha Stewart's website, and really wanted to give it a try. They turned out wonderfully, and were much commented upon. I even googled the proper way to lay out the table, and gave it my best shot with the supplies I had. The dress code for the evening was formal, the company was fabulous, and the evening declared a great success. We're already in the planning stages for the next event, and I simply can't wait. Just thought I'd share a quick NI block with you so you'd know I haven't been slacking off entirely. This one is block 43, and I'm so glad to have it checked off the list. As mentioned in the NI Fans blog, I'm so glad to have this one done, though it wasn't as tough as I anticipated. I used a little spray starch to help stabilise bias edges - love me some Mary Ellen's Best Press! Here I am finally! I've been so busy with working and life that my blog has taken a little of a back seat, but I promise I haven't been neglecting my stitching entirely. Just last night I attached another row to my Nearly Insane quilt, this is the row that contains the block with 229 pieces. The next row has some tricky Lone Star type action, so I'm a little nervous - wish me luck people! I've done a little more work on the applique blocks for Amy, and I've also attached a few of the block borders. The hats are quite cute, and I'm looking forward to embellishing the blocks with ribbon, buttons and other assorted cuteness once the project has been quilted. Just a quickie post. My curtains have been installed! I haven't showed the other room just yet, as I have decided on a pelmet in there too - it looks a little unfinished right now. This past week I finally started work on a quilt project for Amy, she has wanted this one for quite a while, and I was hoping it'd be the project to get me interested again. Amy requested that it's only made in purple and green to suit her room, and I'm happy to accommodate her. I just hope I have enough purple fabric, as a great deal of it has been used up in the scrap project I'm currently working on. The applique work has come to a halt just for the moment though - I've run out of fusible web, and the last three days at work I forgot to purchase some. Hopefully I'll remember tomorrow! And though I haven't been sewing much, it doesn't seem to have dampened my enthusiasm for fabric shopping. In the picture is a little something that arrived last week. I've admired the Short Line pattern since seeing it on Nicole's Sisters Choice blog, and finally decided to just go ahead and get it. I can see it will be a great use for a couple of my jelly rolls and for scraps too. On Tuesday I went along with my friend Vicki to the auction at Small and Whitfield. I was actually really nervous, because I wanted to win the table I'd seen so badly that I could taste it. It was made in the late 1800's, blackwood with two extension leaves. And in the same auction, 10 chairs, one a carver. The chairs were a different lot, and look perfect with the table. Normally I'm not able to make it on a Tuesday, but I couldn't leave an absentee bid, as if I didn't win the table, I wouldn't like to win the chairs, I'm sure you understand. Anyway, I got both lots, and for an excellent price, and I'm more than thrilled. 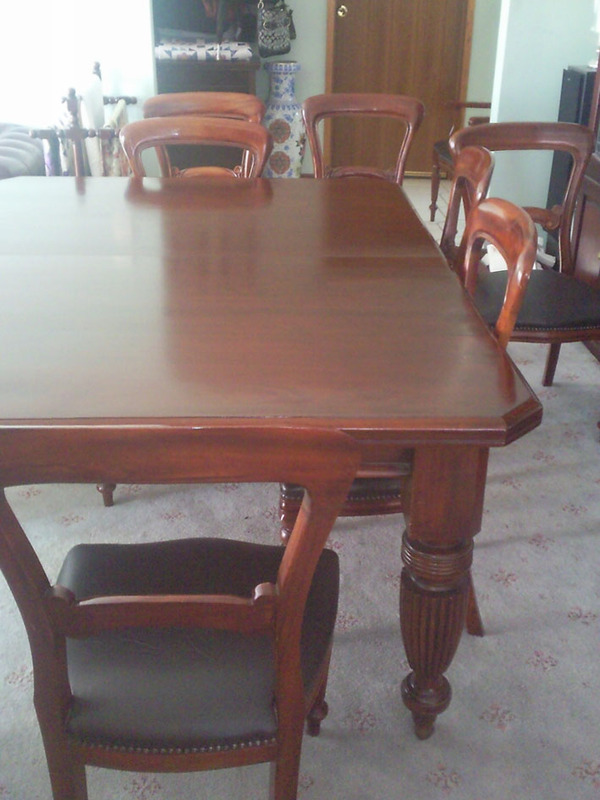 This picture is of the table and chairs as they were dumped in the lounge by the delivery guys. I wanted to share this picture, as you can see the lovely carved legs. The extension leaves aren't in place yet. After Marty got home and we could move the old suite out, we put the new one in place. 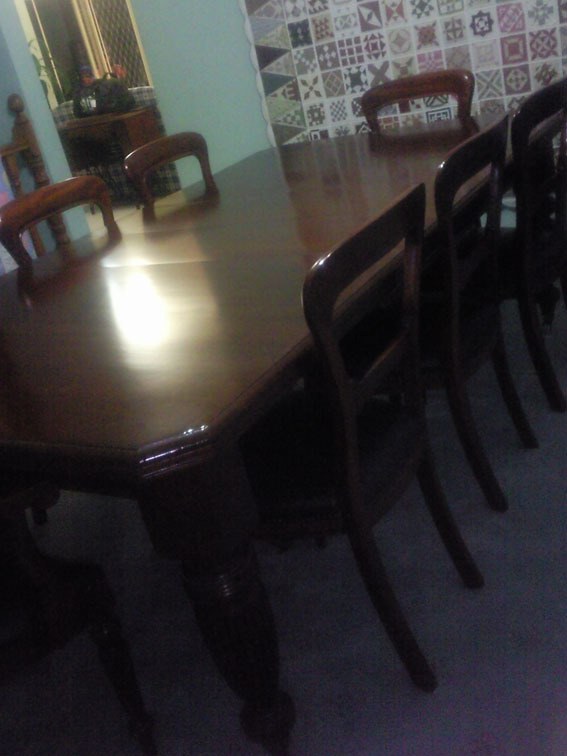 I've put 8 of the chairs around the table, and two are at the other end of the dining room. Apologies for the poor quality of the pictures, I've had to use my phone camera for these ones. And in other other news, I had a call about my new curtains - they will be ready later this week. This is wonderful news, and it means that by next weekend my front rooms should be ALL finished!! Two metres each of three lovely fabrics from Hettie's Patch. Just had to grab the Rouenneries on the left there - that's hard to get now as I'm sure you all know :-) And the others are just random fabrics that grabbed my attention. I've been catching up on my TV series quotient - over the past two weeks I've watched all three seasons of Mad Men, and I'm completely and utterly hooked. Though he's a cad, that Don Draper is just so handsome! Love the styling and interiors ... can't wait until I can get my hands on Season 4. And tomorrow I'm off to an auction to bid on what I hope will be our new dining suite. Very excited about this one. Last time there was an okay suite, which I placed an absentee bid on, and just missed out, and I have to say I wasn't too disappointed. But this time ... I'm feeling it ... wish me luck. Just now I finished putting the rows together on my Double Nine Patch quilt top. My goodness, working with these leader and ender blocks has been a lot of fun! This is probably as far as I'll get for a little while. I need to decide on the perfect inner border fabric for it, and then as you'll see in the next picture, I have a little work cut out for me for the next border. I'm just learning how to use EQ7. I have never used any of the EQ programs before, so I'm on a little bit of a steep learning curve. Despite that, I was able to draw this project up, and I've elected to do a pieced border. There has been precious little sewing in this house in the past week. Apart from being busy (something that doesn't usually stop me from a little time in the sewing room) I don't have any good answers for my inactivity. Let's hope the situation improves in the coming week! There is some exciting news though, I made a final decision on the fabric for my curtains - the fabric you see in the picture. I have also placed the order, the company I have ultimately chosen quoted a full three thousand dollars less than the last estimate I received. And I have it on good authority that they do great work, so it's a win win for me. Four to six weeks time and I'll be able to show off my newest purchases. A while back I was working on these nine patches as leaders and enders, and because I simply couldn't decide what to do with them, I put them away for a little while. On Saturday I got busy playing with EQ7 (because I really need to learn how to use it), and came up with an idea for setting them together. I've put three rows together so far, and have two more to add. 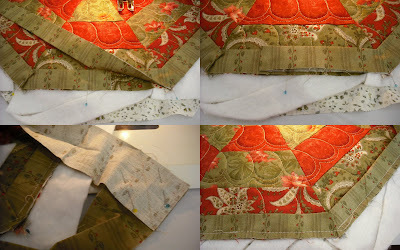 That will probably be the limit for the time being, as I have devised a simple (but heavily pieced) final border. I'll need to really scour my stash for 2" green strips, as this project really whittled them out of my 2" scrap box. 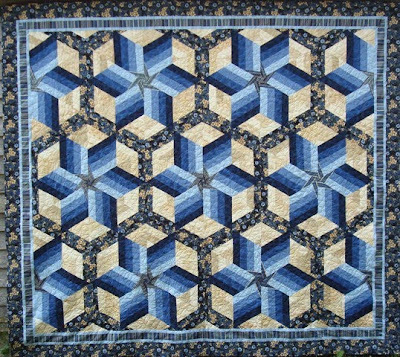 Love this scrappy piecing. Once I've finished this top to the final border stage, I'll get busy again on my pink and purple bow ties. They're super fun too! I will be forwarding your name and email addresses to Barbara Cline, and she'll be in touch with the details of your prizes. Thank you so much to everyone for participating in the blog tour. I'm the last stop on the Blog Tour for Barbara Cline's new book Star Struck Quilts. Leave a comment on this post, and you will be in the running to win the following prizes: 1st prize is a copy of Barbara's fabulous book, 2nd prize is a gift set, including pen-style Chaco-Liner, Flower Head Pins and Mary Ellen's Best Press spray. 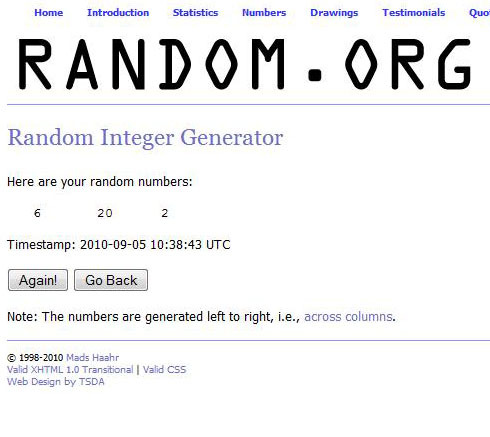 In addition, one winner will be drawn for fabric from RJR and a $25.00 gift certificate to Patchwork Plus. I am Barbara Cline from the great Shenandoah Valley of Virgina. If you have been following the blog tour you can tell I enjoy designing, piecing, quilting, teaching, family, friends and fellowship. I will try to include pictures which will help you get to know me better. First I am a wife and mother of 5 children. They are very close in age. The youngest is 19 and the oldest is 23. O no, now they are leaving home so fast. Yes, I really enjoy my quilt life but there is still work to be done around the house like canning, cleaning, washing and fixing meals. 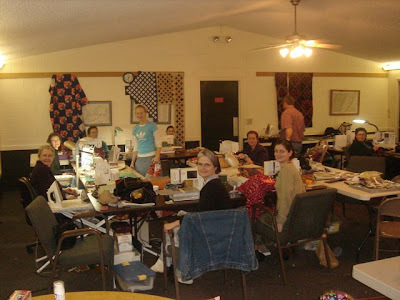 A highlight of the year is when my sisters and I have a sewing retreat. This includes our Mother and nieces. We sew, laugh, cry and just have a wonderful time together. Tazzie here again :-) Be sure to leave your comment, and I'll draw the winners on Saturday evening. Good luck everyone! Hi everyone - just a quick note to let you know that my Turning Four-T quilt will be in Australian Patchwork and Quilting magazine, issue 19/9. The on sale date is October 27, 2010, but for those of you who subscribe, you'll get it a few days earlier. How fun! How exciting, this is a first for me :-) Barbara Cline has released a new book called Starstruck Quilts, and asked me if I would be interested in being part of her blog tour. Being me, I'm late to the game, but still very happy to be involved. 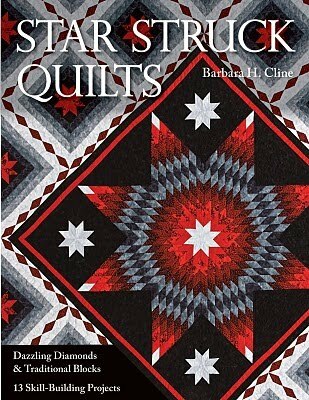 So lucky for me, I've had the chance to check out her book, and can highly recommend it - her quilts are stunning and the directions so clear that you'll be making your own 'starstruck' quilts in no time. And lucky for you, you'll have the chance to win a copy of the book and other treats at each stop on the blog tour. Be sure to pay me a visit on Sept 2nd so you can participate in my giveaway, and you can hear from Barbara too. Happy blog hopping! I've just come home from checking out some fabrics for curtains. It's for my lounge and dining rooms. Three large windows in total. I've wanted to have them made up for the longest time, and for many reasons (such as indecision and allocating funds elsewhere) they have never yet fallen onto the radar. 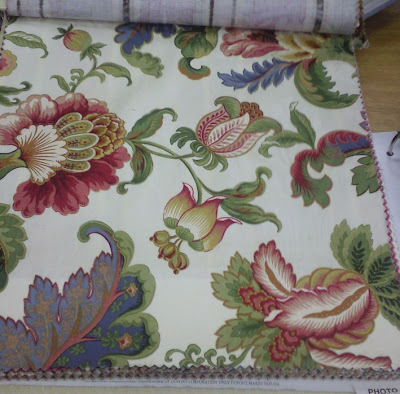 Here is the front runner of the fabrics I looked at today. What do you think? 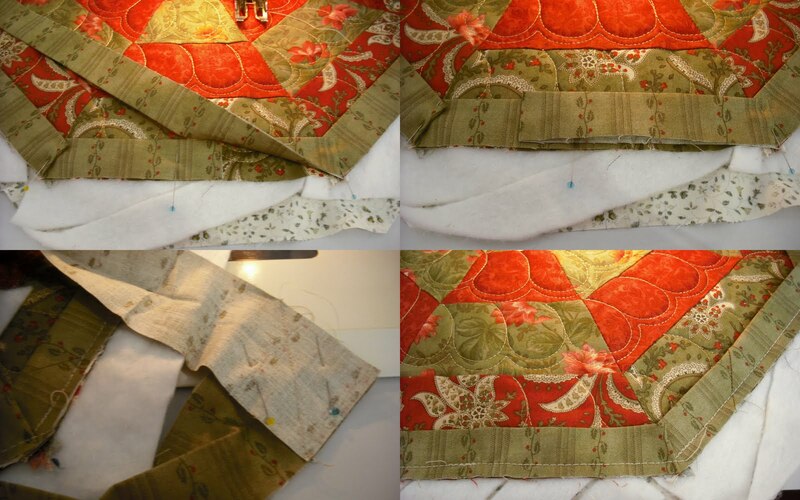 The curtains will be pinch pleated with pelmets, and the bottom of the pelmets will have lovely coordinated cording. I'm thinking it will be really nice, and brighten up the room so much. Now I just have to sit back and wait for the estimate. I've a feeling it's going to hurt. A lot. It's official, I'm completely in love with this project. Thank you so much to our wonderful friend Bonnie Hunter for coming up with such fabulous ways to use our scraps. All I want to do is head into the sewing room now, but there is so much to do. We're off to lunch at my parents house - my brother is moving interstate, so it's a 'goodbye for now' party. And this afternoon I really need to put the house back together. We had ALL the carpets cleaned on Thursday, and due to drying and work, I haven't been able to put everything back in its place yet. The house is in disarray, and I feel very out of sorts in it. Hopefully by late this evening I'll be all done and spend some q-time with my Bernina. And thank you all for your comments on my last post - I haven't had an opportunity to email replies just yet. I feel a weight has lifted after my decision - and let's face it, it's important to look after #1 too. We'll chatter soon - I have signed up for a blog tour which I've never done before, so I'll get busy on that soon. Ohhh my goodness, these blocks are highly addictive. I really need to be doing chores, and I can't tear myself away from the sewing machine. I showed the start of these blocks a couple of posts ago, and while I haven't had tons of sewing time, there has been good progress. The blocks are from Bonnie Hunter's Leaders and Enders book, and the project is called Bowdacious. Bonnie's quilt has bow tie blocks in all the colours of the rainbow, and while I initially cut and started to piece with more colours, I've decided I'm going to stick with pink and purple for the bow ties. There is not a great deal of purple left in my stash after I pieced my Dogtooth Violets quilt, so I'm going to be digging deeply into the scrap tubs to find the perfect pieces. The cute little sashing strips you see there are a Jane Austen print I picked up while in the USA. I'm not sure what the next sashing strips will be, but I'm sure there is something in my closet that I can use. It's my plan to purchase no fabric whatsoever for this quilt. Let's see how far I can run with that. Today I don't have a picture of any fabulous piecing or quilting that I've done lately, but I thought I'd quickly share a little chore I checked off the list in the past week. While I was in the US in April, I purchased some cute prints at the AQS Museum in Paducah - they're Diane Phalen Quiltscapes and very cute indeed. I have finally framed and hung them over my sewing area. I'm just thrilled with them, and they're wonderful inspiration. Recently I have read on a few blogs about people committing to a Process Pledge. I really like the idea, and while I decided I don't need the pressure of a commitment, it has made me think about sharing more about my quilting journey, rather than simply the destination. So, with my latest little project, I took a couple of extra pictures along the way. I wanted to make up some braids and use one of my charm square packs, so first up I sorted the pack into lights and darks. There were a great many more darks, so I cut up some light pieces from my stash too, then I cut each charm square in half to make a series of light and dark rectangles. I added a red from my stash, cut it into squares and began chain piecing the red squares to the dark rectangles. I've based my braid on one found on our dear friend Bonnie's Quiltville site. And then I started piecing the braids together. I made two braids so I could continue to chain piece - I really hate to waste thread! I'm sure you can see I've missed a great many steps here - eg, cutting the strips of braid apart, stitching the sections to make the mats, basting, quilting and preparing the binding. This has been a fun little project, and good for using up left over pieces of batt etc. I just have to hand sew the binding down on the reverse side, and I can call them done!